Tonight’s Preview: The Kelowna Rockets play game five of an opening round playoff series when they face the Kamloops Blazers. The Rockets have a 3-1 series lead after a 4-0 win in game one, a 3-2 victory in game two, a 4-1 loss in game three and a 1-0 win in game four. Game six, if necessary, will be played in Kamloops Sunday night. The Rockets are 4-0 in game 5’s dating back to 2015. Here is a quick recap of the first four games. Game 1: Carsen Twarynski scored twice leading the Rockets to a 4-0 win. Tomas Soustal and Reid Gardiner added singles while rookie Nolan Foote had two assists. Michael Herringer earned the win in goal with a 15 save performance. The Rockets were 2/4 on the power play and a perfect 3 for 3 on the penalty kill. Overall, the Rockets out-shot the Blazers 48-15. Game 2: Dillon Dube scored two-third period goals in the Rockets 3-2 win. The Rockets built up a 3-0 lead on goals from Cal Foote and a shorthanded and power play goal from Dube. Michael Herringer was the first star with a terrific performance. The Rockets were 1 for 6 on the power play while going 4 for 5 on the penalty kill. The Rockets out-shot the Blazers 37-35. Game 3: Lane Bauer scored twice leading the Kamloops Blazers to a 4-1 win over the Kelowna Rockets. Kole Lind scored the lone goal in the loss, his first career WHL playoff goal. Michael Herringer made 34 saves in the loss. The Rockets were 0 for 2 on the power play while going 5 for 5 on the penalty kill. Game 4: Dillon Dube scored the game winning goal in the second period and Michael Herringer made 24 saves in a 1-0 shutout. The Rockets fired a series high 49 shots on net while going 7 for 7 on the penalty killing unit. The Rockets were 0/3 on the power play. Michael, Michael Motorcycle: Michael Herringer has two playoff shutouts in the 2017 post season. The Kelowna Rockets franchise record is 4, set by both Kelly Guard in 2003 and equaled by Derek Yeomans in 2005. Herringer’s career numbers against the Blazers in the playoffs in 11 games results in a goals against average of 2.05 and a save percentage of 0.935. Herringer has been named the WHL Goalie of the Week. Herringer was 2-0-0-0 on the weekend, posting a goals against average of 1.00 and a save percentage of .960. Season in Review: The Rockets finished in 2nd place in the BC Division with 95 points this season. That was one point shy of Prince George in the fight for a BC Division banner. The team was 45-22-5-0, which was good for 6th place in the overall WHL standings. The team scored the third most goals in the WHL (283) and tied with Seattle for the 4th fewest goals against. The team scored 14 more goals and allowed 12 fewer against than in 2015-2016. The Rockets had the third best power play in the WHL and the 9th best penalty killing unit. Cal Thurkauf led the team in goals with 33. Kole Lind had a team high 57 assists while Lind was the scoring leader with 87 points. Nick Merkley led the team with 12 power play goals. Cal Foote had a team high +39 rating. Rodney Southam had a team leading 121 penalty minutes. Rockets Award Winners: General Manager Bruce Hamilton has been named the Western Conference nominee for Executive of the Year. Hamilton won the award back in 1991-1992 with the Tacoma Rockets and in 2002-2003. Forward Kole Lind was named a Western Conference 2nd team all-star. At the teams annual year end awards, Calvin Thurkauf was the MVP, Cal Foote was the Top Defenceman and Nolan Foote was the Rookie of the Year. Reaping Reward of New Recruits: Reid Gardiner played in 28 regular season games with the Rockets after being acquired at the WHL trade deadline. The 21 year-old was held off the scoresheet just three times and collected 18+19=37 in 28 games. Carsen Twarynski, also acquired at the deadline, had 7+15=22 in 28 regular season games after his acquisition from the Calgary Hitmen. If you follow the bouncing ball, the Rockets essentially obtained Twarynski for Joe and Danny Gatenby. That’s a fact Jack: The Rockets have not lost a game 5 series in the opening round since 2010 when they were shutout 4-0 by the Everett Silvertips. The Rockets ended up winning games 6 and 7…The Rockets have generated 30 or more shots in 32 of their last 36 games….The Kelowna Rockets lost 10 of their first 21 regular season games. Since then, the team has 13 losses in the last 54 games…The Rockets are 23-8-2-0 since the trade deadline….The Rockets have 6 players on their roster from the 2015 WHL championship team. The Kelowna Rockets effort Wednesday night in game four of their opening round series with the Kamloops Blazers was eerily reminiscent of what we witnessed in a game one - 4-0 victory. The Rockets dominated territorial play for the opening 40 minutes, but needed several late saves from goaltender Michael Herringer in the 1-0 win. Dillon Dube scored the game winning goal early in the second period and probably could have had three goals in the game if not for the heroics of Blazers netminder Connor Ingram. Dube was the best skater on the ice...again....in a game where the score was not indicative of how lopsided the play indeed was. Despite owning the puck the majority of the night and creating an abundance of scoring chances, the Blazers put a massive scare into the visitors with the goaltender pulled and time ticking down. That's where Michael Herringer was at his game saving best. The 21 year-old, who did his best Rodney Dangerfield routine, 'I don't get no respect', made his sharpest save of the evening when he shut the door on a wrap-around chance from Blazers captain Collin Shirley. The win moved the Rockets within one game of advancing to the second round. The Rockets passing was crisp from the get-go, a clear indication that the team was locked in mentally. The Blazers passing was erratic, much like we witnessed in game one. Like he has done all season long, Connor Ingram allowed his team a chance to send the game into overtime by making a series of solid saves. At games end, Ingram deserved a star, but Herringer also deserved some love for his efforts. Unfortunately, Herringer was not allowed to make the victory skate on the ice with his stick high in the air to the delight of the 40+ fans that boarded a charter bus to cheer on the visiting team. For those wondering, we gave Herringer a star on our AM 1150 broadcast as he earned his second shutout of the series with a 24 save performance. One of the great stories for the Rockets in last night's win was the effort of the penalty killing unit. Assistant Coach Kris Mallette takes great pride in that area of the game he is responsible for. It appears now, the personnel are taking as much pride in it as the competitive coach. The Rockets were 7 for 7 on the PK despite taking some unnecessary penalties in a game that allowed the Blazers just one shot to tie it. Check out this stat. The Rockets have killed off 19 of 20 penalties in this series. 19 of 20! While the power play had some good looks on only three chances, my belief was if they were to lose game four, that unit was to blame. When Blazers forward Nic Holowko took a high sticking minor penalty with about 8 minutes left in the game, the power play could have put the dagger in the Blazers hearts with a goal, yet they couldn't manufacture one. With the players the Rockets are able to put out on the ice in that situation, it should put the fear of God into every opponent. Discipline. This is a tough area for me, because the team took seven minor penalties. That is way too many in a game that means so much. I didn't like Calvin Thurkauf's overaggressive cross checking penalty in the third period with the Blazers coming on and the Rockets protecting a one goal lead. That said, the entire team made Blazers agitator Jermaine Loewen a non-factor. They paid little attention to him and conversely Kamloops head coach Don Hay didn't use him much because of his ineffectiveness. That aspect of the teams' discipline should not go unnoticed. One player I have failed to mention on this blog is defenceman James Hilsendager. Let me say that his evolution as a defender is really starting to catch my attention, When he was acquired in the Jonathon Smart trade with the Regina Pats earlier this season, my expectations were low for a player who's plus/minus stood out like the bald spot on the back of my head. Hilsendager did struggle by making odd decisions while defending in the first 20 odd games with his new team, but his improvement from December to now is off the charts. 'Jimmy', as the players and coaches like to call him, may now be a top 4 defenceman on this team. I honestly believe that. Cal Foote and Lucas Johansen have been wonderful, but Devante Stephens and Hilsendager are also standing out in this series. Hilsendager is clearly the best hitter of the bunch. I also liked Kyle Topping last night. He too has been a nice surprise with his steady play. While he doesn't get the power play time that rookie Nolan Foote receives, the 17 year-old is gaining the confidence of head coach Jason Smith. The playoff win at Sandman Centre was the teams' first since 2009. Last season, the Rockets failed to win two games in that building, but won game three of an opening round playoff series in 2016 when the game was hosted in Kamloops' old Memorial Arena. With game five tomorrow night at Prospera Place, the Rockets look to end the series with a solid effort at Prospera Place. The home team has won three of the four games but scoring that all important first goal seems to be the difference between a win and a loss. Home ice is proving to be a massive advantage in the first three games of the Kelowna Rockets opening round playoff series with the Kamloops Blazers. Lane Bauer scored twice in a 4-1 win last night at Sandman Centre, in what was a three goal second period for the home team. The Rockets still lead the series 2 games to 1, but game four is looming large tonight as the two teams meet for the 4th time in 6 days. I thought the Blazers had slightly more jump in game three and carried that throughout the game. But the Rockets were in great shape in a 1-1 tie before the Blazers broke the game open in the second period with two goals in a span of :28 seconds. Giving up two goals in that short time period, against two evenly matched teams, is hard to come back from. It is deflating both mentally and emotionally and you could see the Rockets sag. It wasn't Jermaine Loewen's game winning goal that made the difference in my opinion. It was Rudolfs Balcers penalty shot goal 28 seconds after that essentially put the game on ice. The penalty shot goal. If you didn't think Balcers deserved a penalty shot opportunity, you are blind. It was a clear a penalty shot call as you will find. No grey area here. Balcers made no mistake by firing a high shot, glove hand side, on Michael Herringer to make the score 3-1. If I'm Herringer, I would cheat glove hand side on the 40 goal man every time. I swear, of the 8 goals Balcers scored against Herringer during the regular season, the majority where up high, top glove. I was wondering when the 19 year-old Balcers was going to start playing in this series. He was a no-show in games one and two. Jermaine Loewen was at his agitating best. Is he that much of a pest that the Rockets can't but pay attention to him? It all started when Loewen delivered a late hit to Calvin Thurkauf, in the first period, inside the Rockets zone when a pass went awry for icing. After that hit, the Rockets paid far too much attention to him, including Dillon Dube taking a run at him in an effort to knock him on his rear end. One of two things should happen tonight. Rodney Southam fights him early in the game, or if Loewen isn't willing, pay little to no attention to him. Save your energy and use it in other ways. The Rockets had their fair share of scoring chances in the game, but according to the Kelowna Rockets analytics team, the shot clock wasn't exactly true. The Rockets had 23 shots on net, not the 38 that were shining brightly on the Sandman Centre shot clock. If that indeed is true, 23 shots on net won't win you too many games against elite goaltending. In game four, the Rockets must find a way to get secondary shots on goal and do a better job of finding shooting lanes in an effort for those shot attempts not to be blocked. How about some cup half full comments? It was nice to see Kole Lind score his first career playoff goal. It took him 26 playoff games to find the back of the net, but his nice wrister to the low corner was a beauty and tied the score at 1. Lind must be a factor in this series. The scouts are watching. I thought it was a solid game from Michael Herringer. In a building that hasn't exactly been kind to the 21 year-old goalie, I thought Herringer was dialed in and made several solid stops. Of the four goals he surrendered, he had no chance on the 2 on 1 goal. The penalty shot goal is a great shot on a one on one situation. Lane Bauer's second goal of the game is a point blank wrister when Rockets rookie Nolan Foote delivers a perfect pass on Bauer's tape on a turnover inside the defensive zone. The only goal in question was Loewen's weak backhander that somehow found the back of the net. What have we learned here? The home team has won all three games.The team that scores first has won all three games. The team with the lead heading into the third period has won all three games. What's the key tonight? Obtaining all three I suppose. On a side note, it was nice to see Blazers Athletic Therapist Colin Robinson recognized before last night's game by the WHL for his 1,500th game earlier this season. Even Richard Doerksen was on hand to present 'Toledo' with the award. Gord McGarva will join me tonight for game four on AM 1150. We have the pre-game show at 6:30 and the play-by-play at 7:05. Tonight’s Preview: The Kelowna Rockets play game three of an opening round playoff series when they face the Kamloops Blazers. The Rockets have a 2-0 series lead after a 4-0 win in game one and a 3-2 victory in game two. Games three and four are tonight and Wednesday in Kamloops with game five (if necessary) in Kelowna Friday night. Here is a quick recap of the first two games. Playoff Pondering: Michael Herringer has been named the WHL Goalie of the Week. Herringer was 2-0-0-0 on the weekend, posting a goals against average of 1.00 and a save percentage of .960….The Rockets are 1-4-0-0 in their last 5 playoff games at Sandman Centre. The Rockets only win in Kamloops in last year’s playoff series was in game three, but the game was played at Memorial Arena. The last time the Rockets won a playoff game at Sandman Centre was in game four of an opening round series in 2009. The date was March 25, 2009 in a 5-3 win. Jamie Benn had 1+3=4 in the victory….The Rockets are attempting to advance to the Western Conference final for a fourth straight season…The Portland Winterhawks went to the Western Conference final 5 consecutive seasons (2010-2015). Rockets Award Winners: General Manager Bruce Hamilton has been named the Western Conference nominee for Executive of the Year. Hamilton won the award back in 1991-1992 with the Tacoma Rockets and in 2002-2003. Forward Kole Lind was named a Western Conference 2nd team all-star. At the teams annual year end awards, Calvin Thurkauf was the MVP, Cal Foote was the Top Defenceman and Nolan Foote was the Rookie of the Year. The Unsung Player of the Year was Devante Stephens while the Most Improved Player was Kole Lind. Lind had 46 more points than he had a season prior. That’s a fact Jack: …The Rockets have now won 20 or more road games in five consecutive seasons. The last time they failed to hit 20 wins was in 2011-2012 when they won 15 games away from Prospera Place…The Rockets have generated 30 or more shots in 30 of their last 34 games….The Kelowna Rockets lost 10 of their first 21 regular season games. Since then, the team has 12 losses in the last 52 games… In the Rockets last 13 losses (regulation or overtime loss) the opposition has opened the scoring…The Rockets are 22-7-2-0 since the trade deadline….The Rockets have 6 players on their roster from the 2015 WHL championship team. What have we learned in the first two games of the Kelowna Rockets opening round playoff series with the Kamloops Blazers? These two teams are more evenly matched than what we witnessed in game one. The Rockets were almost flawless in the 4-0 victory and the Blazers were nowhere near to the level they needed to be at this time of the year. When you have two teams that were separated by 5 points in the toughest division in the standings during the regular season, neither is a slouch. No one is a push over. While the Rockets have a 2-0 lead in the best of seven series, it could easily be tied 2-2 if the Blazers hold court with two consecutive games at Sandman Centre. That's why game three is so important tomorrow night. If the Rockets win, they are clearly in the drives seat. If the Blazers earn the victory, it's a completely new series. Everyone I talked too expressed how they thoroughly enjoyed both games at Prospera Place this weekend. As a broadcaster, I often find my judgment clouded by players making mistakes with the puck that they wouldn't otherwise, but it is those mistakes that translate into goal scoring chances, which in the end, creates entertainment. At the end of the day, isn't that the reason why people watch major junior hockey in the first place? The entertainment value is terrific and I didn't talk to one Rockets fan who complained after game two that it was boring. They didn't leave their seat until the final buzzer as the Blazers battled back from a 3-0 deficit. In the end, regardless of the outcome, if the game is entertaining, which it was both nights, the paying public can't but be happy...which they indeed were. Ok, the exception would be a few Blazers fans, but you get the idea. Michael Herringer is indeed a pressure goalie. How many times has he come up big in the big game? I mean really? Countless times. In game 7 wins over Kamloops and Victoria last season, was Herringer solid? How good was he in game four against Seattle where he faced over 70 shots as it went deep into overtime. How good was he in game two Saturday night? Herringer has proven time and time again he can perform in the big game, yet he still has his doubters. Such is the life of a 20 year-old goaltender who had his share of ups and downs this season. Will he struggle in this series? Did Connor Ingram, an elite goaltender in this league, struggle in the first two games by allowing goals he probably should have stopped? It happens to the best of them. From a Rockets perspective, the ability to score on Blazers goaltender Connor Ingram in game one was huge. I am not saying it came easy, but they were able to find success against him and have indeed proven that he is human. Oh sure, he will frustrate you at times, much like Michael Herringer did to Quinn Benjafield and Collin Shirley in game two. My fear was Ingram opening the series by looking like a piece of plywood over the net, with no chance for the Rockets skilled forwards to get a puck past him. Then it becomes a mind game and the Rockets shooters become too fine in their approach to shoot for corners. Dillon Dube's shorthanded squeaker through the 5 hole in game two was a good reminder that no shot is a bad shot. One fan asked me after game one why Cal Foote doesn't wear the same number his father, Adam, wore in the NHL? The Rockets do not give a 'skater' a number exceeding 29. That jersey is worn by Nolan Foote. Cal did the next best thing. The 17 year-old wears sweater #25, which is the reverse digits of what his father wore for 19 seasons in the NHL. Why does Nolan Foote wear #29? His birthday is on the 29th of November. To think, Cal Foote was born pre-mature in December, 1998. At the time he weighed just 5 pounds, 10 ounces. Now he has size 16 feet and is 6'4 and weighs 210 pounds. I am often asked about this team and if it is indeed better than a season ago? I believe the overall chemistry/harmony within the team is better. Not like it was bad in 2015-2016, but the players really, really like one another. What I've witnessed on the bus this season often made me smile, knowing full well, that they would battle hard for each other when it really counted. In the last 6 playoff games between the Rockets and the Blazers, dating back to last season, I've come to the conclusion that no one game is a springboard to success in the next game. I haven't seen a momentum shift one way or the other after one team losses and the other team wins. In fact, in the last two playoff series between these two teams, it marked the first time (games 1 and 2) that the same team won back-to-back games. The old cliche', 'Don't get too high and don't get too low' really applies here. Just when you think you have the other team down and out, they rise from the ashes and put in a great effort. What can we expect in game three? The Blazers need to play their best game. They do not want to go down 3-0 in the series, which would be playoff suicide. While it is doable to come back from that deficit (just ask the 2012-2013 edition of the Kelowna Rockets) it would be extremely unlikely against two teams so closely matched. The Rockets need a better effort from everyone in game three and play much like they did in the third period of game two. I thought they finally got back to what made them successful despite giving up two, bang, bang goals late in the game. We will see you in Kamloops tomorrow night. Gord McGarva will make the trip with me for both games and will provide colour commentary. Talk to you on the radio (AM 1150) at 6:30 pm. In the playoffs, one game does not mirror the next. 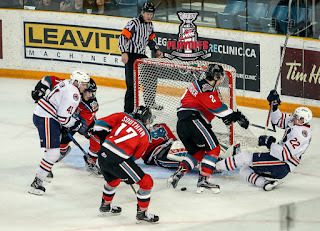 A good example was Saturday night in game two of the Kelowna Rockets opening round playoff series with the Kamloops Blazers. While the Rockets own a 2-0 lead in the best of seven, had it not been for goaltender Michael Herringer, this series would be going back to Kamloops tied at one win apiece. After dominating every facet of the game in a 4-0 win Friday night, the Blazers, not surprisingly, were considerably better in game two. What was shocking was how the Rockets game regressed from game one. I was doubtful the home team would be able to put on a clinic for a second straight game, but I didn't expect them to struggle in the smaller areas of the game that make a huge difference. The passing wasn't crisp, the intensity was significantly lower and the execution took a step back from what we witnessed in game one. That said, was it an entertaining game? Yes. Did the Rockets win? Yes they did. Again, the story in game two was Michael Herringer, With the Rockets holding a 1-0 lead, the 21 year-old took a goal away from Blazers forward Quinn Benjafield with a blocker save that, at the time, looked like the turning point in the game. It wasn't. In the second period, on a great three way passing play, with the score still 1-0, Herringer dove across to his right, and with the paddle of his stick, knocked the puck out of mid-air from a shot by Blazers 20 year-old Collin Shirley. Herringer was named the 1st star and was clearly the best player on the ice. While surrendering two late third period goals, his heroics were the reason behind the game two victory. Michael Herringer's shutout streak was 113:59. Dillon Dube was the offensive hero with two-third period goals. The shorthanded goal he scored was massive but it was his power play goal with about 6 and a half minutes left in the game that stood up as the game winner. Dube, with those two goals, has equaled his playoff goal total from all of last season when he scored only twice in 18 post season games. Everyone will be talking about the officiating after this one. The sour tone will come after Dillon Dube was tripped up (no call) inside the Blazers zone before Gordie Ballhorn was assessed a tripping minor on the same sequence less than 30 seconds later. With Ballhorn in the penalty box, the Blazers scored to make it 3-2. The officiating crew handed out a soft, third period tripping penalty on Ondrej Vala after Nick Merkley went down easily behind the Kamloops net. Frankly, Merkley could have been called for embellishment. It always seems to even itself out at games end. The Rockets have opened the scoring, have carried the lead into the third period and have out-shot the Blazers in both games in this series. Cal Foote was one of the bright spots again for the Rockets with a goal and an assist. The teams' defenceman of the year always plays well and makes smart plays with and without the puck. His younger brother, Nolan, was clipped with a high stick late in the second period by Garrett Pilon and had to go for stitches. This game was played 21 minutes faster than game one. While more penalties were called, the needless pushing and shoving after the whistle wasn't as prevalent as in game one. Who was the best Blazer? I thought Deven Sideroff was more noticeable and 20 year-old Lane Bauer worked hard. Rudolfs Balcers has been as quiet as a field mouse in the first two games. It is hard to believe but Sideroff, the Blazers leading scorer and Kole Lind, the Rockets leading point producer during the regular season, are pointless in this series. Sideroff and Lind also have one other thing in common. Neither has scored a post season goal...ever. Sideroff is 0+3=3 in 9 playoff games while Lind is 0+3=3 in 25 post season appearances. It doesn't get any easier as the next two games will be played in Kamloops on Tuesday and Wednesday night. The Blazers had the best home ice record in the BC Division and had the second most wins (26) at home in the Western Conference this season. Only Seattle (27) had more wins in front of their home town fans than the Blazers did. There is no such thing as a perfect playoff game. But if indeed their was, the Kelowna Rockets were darn close. In what can only be described as a dominating playoff performance Friday night, Carsen Twarynski scored twice and added an assist in the Rockets 4-0 win over the visiting Kamloops Blazers. Michael Herringer made 15 saves for his third career playoff shutout as the Rockets took a 1-0 lead in the best of 7 series. Game two is tonight at Prospera Place. From the opening puck drop to the final buzzer, the Rockets owned the ice and stunned the visitors in the most lopsided game between the two teams, win or lose, this season. One game does not make a playoff series, but it was the type of start the home team was looking for. Will we see the Rockets build off this win, or sag like they did after a game one win a season ago against this very opponent? Last season the Blazers won game two (5-4) after losing the opener. This win was as dominant a playoff game as we've witnessed since game four of the Western Hockey League final against the Brandon Wheat Kings in 2015. The Rockets took over that game and the Wheat Kings had no answer. Up until last night's two goal effort, Carsen Twarynski had just 1 goal in 21 career playoff games as a member of the Calgary Hitmen. The 19 year-old third round NHL draft pick of the Philadelphia Flyers showed off his quick release and was named the 1st star with his three point night (2+1=3). Playing on a line with Dillon Dube and Tomas Soustal, the chemistry between the trio make them as dynamic as the first line of Calvin Thurkauf, Reid Gardiner and Nick Merkley. While Tomas Soustal wasn't given a star in the building, his impact was immediate after sitting out 8 games with an injury. Soustal's size mattered on this night as he powered his way to loose pucks and had a goal and an assist. Clearly, Soustal is a better match on that line with Dube and Twarynski, as opposed to Kole Lind, who is better served playing with Rodney Southam and Nolan Foote. Foote ended the game with two assists. The scoring chances in the game are a good indicator of how it unfolded. The Rockets had 19 scoring opportunities, The Blazers? 2! How about the fourth line? I thought Jack Cowell, Kyle Topping and Eric Gardiner were terrific. No surprise here. Reid Gardiner had a team high 9 shots on net. I loved his decision to shoot on a two-on-one with Calvin Thurkauf in the first period. While he didn't score, it was a puck on goal. We saw a similar odd man rush for the Blazers in the third period where captain Colin Shirley had a clear shooting lane but passed the puck to Nic Holowko. The end result was no shot on net. Defenceman Lucas Johansen was eating up a lot of ice with a team high 24 minutes. I thought the Rockets, for the most part, where making clean exits out of their own zone. While it starts with the d-man, the forwards play a large part in making it look smooth. Michael Herringer's career playoff numbers are much different than his career regular season totals against the Blazers. The 21 year-old's career goals against average is 1.94, with a save percentage of .938 and three shutouts. What type of night was it? Rookie Jake Cowell won his first playoff fight in the WHL when he squared off with 16 year-old Blazers forward Jackson Shepard in a surprising tilt. Combined, the two players weigh 335 pounds. Divided by two, that's 168 pounds apiece. Paper weight material, yes, but spirited fight all the same. Cowell's first WHL tilt came this season against Vancouver's Johnny Wesley. The save of the game, which might not have been detected by some, came from Blazers goaltender Connor Ingram 30 seconds into the third period. After receiving a high shot in the mask from forward Reid Gardiner, the 19 year-old went down on his belly with his face towards the ice. Did you notice how the puck went high in the air, bounced off defender Luke Zazula and bounced into Ingram's catching glove? It was an amazing save. It looked like Ingram had a magnet in his glove as the puck found it's way there. Had it not, it would have been in the back of the net and the Rockets would have had an early-third period 4-0 lead. The best Blazer? On this night Jermaine Loewen seemed to be the most engaged. The 'bobble head bruiser', as I like to call him, had good jump in his game and was at his antagonizing best. Always playing to his strengths, Loewen attempted to make life measurably for Dillon Dube and Nick Merkley specifically. At one point he took Dube off the ice after he agitated the skilled forward by baiting him into a minor penalty for slashing. If Loewen can do more of that in this series, job accomplished for the big man. I had to chuckle in a pre-game interview with Dillon Dube. I spoke to him about the 37 games of playoff experience he has under his belt, with his eyes lighting up in amazement when I threw out that number. Dube was a 16 year-old who went all the way to the WHL championship (18 games) before playing in all 18 post season games and a birth in the Western Conference final last season. Dube, who signed an NHL contract Friday with the Calgary Flames, played one playoff game as a 15 year-old. As solid as the game one win was, it isn't necessarily how impressive the Rockets were on opening night as how they respond in game two. Do they let down there guard? Are they relentless in their approach or do they let the Blazers back in the series? Great teams don't relent. Solid teams force it down the opponents throat by dictating the play from the opening puck drop. It will be interesting to see how both react in Saturday nights rematch. Tonight’s Preview: The Kelowna Rockets open the 2017 Western Hockey League playoffs against the visiting Kamloops Blazers. These two teams met in the opening round a season ago with the Rockets advancing with a game 7 overtime win. These two teams met 10 times this season with the Rockets winning four of them. The last two meetings in February were blowouts for both teams, with the Blazers winning 6-0 (Feb 8, 2016) and the Rockets winning 8-2 (February 24, 2017). Kole Lind had 3+6=9 in the seasonal series while Rodney Southam had 1+8=9 in the 10 games. Nick Merkley had 8 points (3+5=8) in eight games. Michael Herringer was 3-5-0-0 in eight starts, with-a-goals against average of 3.53. Rudolfs Balcers led the Blazers with 8+4=12 in 8 games against the Rockets. The two teams were separated by only 5 points after being 15 points apart heading into last year’s post season. In the big picture, the team has 18 wins in the last 22 games (18-3-1-0) while earning a point in 16 of their last 18 games (15-2-1-0). Playoff Pondering: Nineteen year-old forward Nick Merkley and 20 year-old Captain Rodney Southam both have 40 games of WHL playoff experience under their belt. Merkley has 9+38=47 playoff points….Reid Gardiner may have played 290 regular season games in the WHL, but the 21 year-old has never gotten out of the first round. Gardiner has played just 14 playoff games and has 5+4=9 over that period…Tomas Soustal is the highest returning point producers from last year’s post season. Soustal had 5+7=12 in 18 playoff games including three of those goals coming in the opening round against the Blazers…Weird stat. Despite going all the way to the Western Conference final last season, the Rockets playoff record was a very ordinary 8-10-0-0….Justin Kirkland was the Rockets leading scorer in the 2015-2016 playoffs with 11+4=15 in 18 games…Michael Herringer played in all 18 playoff games a season ago, posting a goals against average of 2.44 and a save percentage of .928…The Rockets are attempting to advance to the Western Conference final for a fourth straight season…The Portland Winterhawks went to the Western Conference final 5 consecutive seasons (2010-2015). Calvin Thurkauf is the first European born player to be named the Kelowna Rockets Most Valuable Player. The 19 year-old from Switzerland took home the top honour at the teams' annual year-end awards banquet Sunday at the Kelowna Community Theatre. Thurkauf, who is also a Canadian citizen considering his father was born in Vancouver before moving overseas, had 33 goals this season and 70 points in 60 games. Thurkauf not only led his team in goal scoring, but he represented his country for a second consecutive season at the World Junior Hockey Championships. Suggested as the most 'pro ready' by the Rockets coaching staff, Thurkauf signed an NHL contract with the Columbus Blue Jackets on December 30th. The power forward has had success playing on a line this season with Nick Merkley and overager Reid Gardiner, producing 19 multiple point games. It is safe to say that Thurkauf is the best European forward the team has ever selected in the CHL Import Draft. You can argue he is the best ever, but it is hard to ignore Slovakian defenceman Tomas Slovak who was chosen by the team 4th overall in the 2001 CHL Import Draft. Slovak, for those who can't remember, had 18 goals and 71 points in 65 games during the 2002 season. Tonight’s Preview: The Kelowna Rockets close out the home portion of their schedule tonight against the visiting Vancouver Giants. This is the 7th of 8 meeting between these two teams. The Rockets are 5-1-0-0 in the first six games, having out-scored the Giants 19-1 in the last three meetings. Overall, the Rockets have out-scored the G-Men 34-13. The Rockets have won 23 consecutive home games over the Giants. The Rockets are coming off a 4-1 loss Wednesday night to the Everett Silvertips. Dillon Dube scored the lone goal, the teams’ first loss in 8 games. In the big picture, the team has 16 wins in the last 20 games (16-3-1-0) while earning a point in 14 of their last 16 games (13-2-1-0). Following tonight’s game the Rockets close out the regular season against the Giants tomorrow night in Langley. The Rockets have scored 74 goals in their last 16 games (4.6 goals per game). Too Hot to Handle: Kyle Topping had his 8 game point streak snapped Wednesday night. Topping had 3+5=8 over that period. Cal Foote has points in four of his last five games (1+6=7). Calvin Thurkauf has points in 6 of his last 8 games (3+8=11). Dillon Dube has a 5 game point streak (7+5=12). Milestones: Lucas Johansen played in his 200th career game Wednesday night…Rodney Southam’s next point will be the 100th of his WHL career…Devante Stephens played in his 200th game last Saturday night. …Gordie Ballhorn played in his 100th game Saturday vs. Victoria. Streak’n: The Rockets have scored more goals (271) than they did all of last season (269). The team has allowed 204 goals against, which is 14 less than a season ago with two games remaining...Reid Gardiner had his 15 game point streak snapped Wednesday night. Gardiner had 10+12=22 over that stretch. Kole Lind had a 13 game point streak earlier this season. The 21 year-old Gardiner also has goals in 7 of his last 10 games. Rodney Southam has points in 9 of his last 13 games with 7+8=15 over that stretch. Dillon Dube has points in 11 of his last 12 games (12+13=25). Dube also has goals in 9 of his last 11 games. Dube has12 goals in his last 11 games. That’s a fact Jack: The Rockets are 26-4-0-0 in their last 30 regular season meetings against the Giants…The Rockets are 11 for 30 on the power play (36.7%) against the Giants this season….The Rockets have killed off 26 of 30 chances while shorthanded against the G-Men this season…Calvin Thurkauf has 3+7=10 in 6 games against Vancouver this season. Cal Foote and Kole Lind both have 3+5=8 in the six games…James Hilsendager has a team leading +8 against the Giants…The Rockets 7 game winning streak was the longest since the team won 10 straight games in 2014-2015…Michael Herringer was named the WHL Goalie of the Week March 6th by posting a record of 3-0-0-0 with a goals against average of 1.10…Lucas Johansen signed an entry level deal with the Washington Capitals. Johansen was a 1st round pick of the Caps this summer…The Rockets have played 35 road games this season, with one more stop in Vancouver…The Rockets have now won 20 or more road games in five consecutive seasons. The last time they failed to hit 20 wins was in 2011-2012 when they won 15 games away from Prospera Place…The 56 shots the Rockets put up against the Vancouver Giants February 10th were a season high….The 15 shots the team surrendered February 22nd against the Edmonton Oil Kings was a season low…The Rockets have generated 30 or more shots in 27 of their last 31 games…The Rockets have surrendered 5 or more goals 13 times this season. The teams’ record, not surprisingly, is 1-11-2-0. Broadcasters Bits: Tomas Soustal is missing his 7th straight game tonight after being hurt March 1st against Prince George. The Rockets are 11-2-0-0 in 13 games when Soustal has been injured this season….The Rockets are 62-1-4-0 when leading after 40 minutes in the last two seasons….The Kelowna Rockets lost 10 of their first 21 regular season games. Since then, the team has 12 losses in the last 49 games… In the Rockets last 13 losses (regulation or overtime loss) the opposition has opened the scoring…The Rockets are 18-7-2-0 since the trade deadline The Rockets compiled a record of 10-2-1-0 in 13 games in 26 days in February…The Rockets were 8-3-2-0 in December...The Rockets were 6-4-0-0 in 10 games in November after going 8-4-0-0 in 12 games in October…The Rockets are the only team in the WHL that has failed to surrender a shorthanded goal against this season…The Rockets are 19-12-0-0 against BC based teams this season …The Rockets were 11-4-3-0 against U.S Division teams this season. The Everett Silvertips are the best shot blocking team in the Western Hockey League. Hands down the best. No one commits more to the craft than the team that skated into Prospera Place last night and earned a 4-1 win over the Kelowna Rockets. Don't be fooled. While Tips goaltender Carter Hart was named the 1st star, which to me is a bit of a head scratcher, it was the players in front of him that paid the price in stopping the home teams seven game winning streak. The numbers don't lie. The Rockets had 41 shot attempts after 40 minutes, but of those 41 shot attempts, only 22 reached the net. As the game went along, despite attempting to push the pace, the Rockets game became fractured and over-passing and second guessing when a shooting lane became available was common place. It all added up for a tough night for a team that has had a heyday in the offensive zone in the last month. Only Dillon Dube, the most consistent Rockets forward on the score-sheet, found the back of the net with his 20th goal of the season. Nothing changed in the standings for either team though. The Rockets remain two points back of Prince George for first place in the BC Division while the Tips are a single point back of Seattle in the fight for first place in the US Division. Again, it was the easiest first star award Carter Hart is going to earn. Did he make a five alarm save in the game? A good indication is my voice at games end. It felt relatively fresh as I had no need to explode as the Rockets failed to storm the Tips net with shot after shot which created glorious chance after glorious scoring chance. It didn't happen. The Rockets ruled the outside of the ice, with pin point passing, but that is a non-scoring area and the Tips were allowing them all the room they needed. Getting to the inside/middle of the ice was a completely different story. It was like a no-fly zone for the Rockets, who couldn't generate much from that prime scoring area. Despite pushing the pace in the third period in an effort to close the 3-1 deficit, while territorial dominating, the Rockets had only 5 shots on goal. Five! The Tips had 10 and ended up keeping the highest scoring team in the Western Conference to under 30 shots on net. An impressive feat in itself. Scoring the opening goal is always a key, but my belief is scoring first against Everett is more important than against any other team in the WHL. When you are forced to chase the game and the Silvertips sell out on defense, it makes for a frustrating experience in order to claw back in the game. Again, no one defends better. Despite receiving 5 power play chances, which against the Tips is an astronomical amount against the least penalized team in the 22 team circuit, the unit generated only 4 shots on goal. That tells you how good Everett was in all areas of the game. How about James Hilsendager's first period hit on Tips forward Connor Dewar? Wow! The 19 year-old d-man delivered a clean hit on Dewar at centre ice, sending the 5'10, 170 pound forward sailing right into the Rockets bench. In my opinion, it was the best hit of the season, edging out a similar hit Calvin Thurkauf applied earlier this season when he too sent an opposition player into the Rockets bench. Reid Gardner had his 15 game point streak come to an end. A win would have moved the Rockets into a tie with Prince George for first place in the BC Division. It didn't happen. With two games left (both against the Vancouver Giants) the Rockets must win both, but more importantly, the Kamloops Blazers must beat Prince George at least once as those two BC Division rivals end the regular season with a home and home series. If the Blazers lose both, or the Cougars win both, it doesn't matter how the Rockets do this weekend. They will finish second. Well, that's not exactly true. If the Blazers would win both this weekend and the Rockets would lose both, Kamloops would overtake Kelowna and move into second place in the BC Division, which would mean the Blazers would have home ice advantage in an opening round series. Confused? The bottom line is all three BC Division teams have much to play for heading into the final weekend of the regular season. Heading into the final weekend, three teams in the BC Division are within striking distance of one another. Prince George has a two point lead for first place while the Rockets are only three points up on the third place Kamloops Blazers. This is the best race since the introduction of the BC Division in 2001-2002. That season, Kamloops finished 1st with a two point lead on second place Kootenay. The Ice earned second place with a slim 4 point lead over third place Prince George. Tonight’s Preview: Welcome to the final week of the 2016-2017 regular season. The Kelowna Rockets play their second to last regular season home game tonight against the visiting Everett Silvertips. This is the 4th and final meeting of the season between the two teams. The Rockets are 2-1-0-0 in the three games with all three being decided by a single goal. Two of the three games have needed more than regulation time, with the Rockets winning 4-3 in overtime on October 19th and winning in a shootout on March 3rd with a 3-2 victory. The Rockets are 5-0-2-0 in their last 7 regular season games at Prospera Place against the Tips and 9-3-3-0 in the last 15 meetings between the two teams. Reid Gardiner and Lucas Johansen each have 2 goals against the Tips in the three games. The Rockets are coming off a 4-3 overtime win against the Victoria Royals Saturday night. Dillon Dube scored the game winner and collected four points (2+2=4) in the teams 7th straight victory. The team has 16 wins in the last 19 games (16-2-1-0) while earning a point in 14 of their last 15 games (13-1-1-0). Following tonight’s game the Rockets close out the regular season this weekend with a home and home series with the Vancouver Giants. Overall, the Rockets have won 7 straight and have scored 73 goals in their last 15 games. Too Hot to Handle: Kyle Topping has an 8 game point streak (3+5=8). Cal Foote has a four game point streak (1+6=7). Calvin Thurkauf has points in 6 of his last 7 games (3+8=11). Dillon Dube has a four game point streak (6+5=11). Milestones: Rodney Southam’s next point will be the 100th of his WHL career….Reid Gardiner played in his 285th career game last Tuesday…Devante Stephens played in his 200th game Saturday night. …Gordie Ballhorn played in his 100th game Saturday vs. Victoria. Streak’n: Reid Gardiner enters tonight’s game riding a 15 game point streak. Gardiner has 10+12=22 over that stretch. Kole Lind had a 13 game point streak earlier this season. The 21 year-old Gardiner also has goals in 7 of his last 9 games. Rodney Southam has points in 9 of his last 12 games with 7+8=15 over that stretch. Dillon Dube has points in 10 of his last 11 games (11+13=24). Dube also has goals in 8 of his last 10 games. Overall, Dube has11 goals in his last 10 games…Carsen Twarynski has 6 goals in his last 10 games. That’s a fact Jack: This 7 game winning streak is the longest since the team won 10 straight games in 2014-2015….Lucas Johansen plays in his 200th career game tonight…The last time the Rockets came into the playoffs this hot was in 2012-2013 when the team was riding a 6 game winning streak…. …Michael Herringer was named the WHL Goalie of the Week March 6th by posting a record of 3-0-0-0 with a goals against average of 1.10…Lucas Johansen signed an entry level deal with the Washington Capitals last Thursday. Johansen was a 1st round pick of the Caps this summer…The Rockets have 91 points this season, with 6 available points over the final 3 regular season games. The most points the team can earn this season is 97, which puts them three shy of the 100 point barrier the team has reached in each of the last four seasons…The Rockets have played 35 road games this season, with one more stop in Vancouver…The Rockets have now won 20 or more road games in five consecutive seasons. The last time they failed to hit 20 wins was in 2011-2012 when they won 15 games away from Prospera Place…The 56 shots the Rockets put up against the Vancouver Giants February 10th were a season high….The 15 shots the team surrendered February 22nd against the Edmonton Oil Kings was a season low…The Rockets have generated 30 or more shots in 27 of their last 30 games…The Rockets have surrendered 5 or more goals 13 times this season. The teams’ record, not surprisingly, is 1-11-2-0. Broadcasters Bits: The Rockets were 15 points out of first place in the BC Division at one point. Now they are just two points off the pace with a game in hand on Prince George….The Rockets are 62-1-4-0 when leading after 40 minutes in the last two seasons….The Kelowna Rockets lost 10 of their first 21 regular season games. Since then, the team has 11 losses in the last 48 games… In the Rockets last 12 losses (regulation or overtime loss) the opposition has opened the scoring…The Rockets are 18-6-2-0 since the trade deadline The Rockets compiled a record of 10-2-1-0 in 13 games in 26 days in February…The Rockets were 8-3-2-0 in December...The Rockets were 6-4-0-0 in 10 games in November after going 8-4-0-0 in 12 games in October…The Rockets are the only team in the WHL that has failed to surrender a shorthanded goal against this season…The Rockets are 19-12-0-0 against BC based teams this season …The Rockets are 11-3-3-0 against U.S Division teams this season. Wins come in all shapes and sizes. Some are complete efforts while others are up to the goaltender to keep you in the game before you finally find your footing. Right now the Kelowna Rockets are winning in various ways and no one is complaining. Would you if your team had won a season high 7 straight games and were two points out of first place in the BC Division? Didn't think so! Michael Herringer was solid early and Dillon Dube was great late, leading the Rockets to a 4-3 overtime win Saturday night over the visiting Victoria Royals. Herringer made several solid stops, including a breakaway save on 48 goal man Matthew Phillips when the game was scoreless and the Royals were carrying the play. Dube finished the night with two goals and two assists, and for second straight game, was named the first star. Sometimes statistics are flattering until you peel back the layers which show Dube was on the ice for two of the three Royals goals. So, it is safe to say, the 18 year-old wasn't very good early but was able to come through when his team needed him the most. I thought the penalty killing unit had a very good night and may be the real story in the win. The Royals scored once on 6 chances, but were a massive threat every time they had a chance. In a game where I thought the Rockets took too many unnecessary penalties, the PK saved them in a game that could have gotten away. I hate to pick on Dube again, but he took two needless charging penalties and Calvin Thurkauf took a double minor with 7 and a half minutes to play that could have cost them the game. But the PK came to the rescue again. Take a bow. Both players were named stars at games end, but the best players must lead in all areas, including discipline. Did anybody notice that rookie Kyle Topping is riding an 8 game point streak? Cal Foote does not get the credit he deserves. The reason? He isn't flashy. How many times does he get beat one-on-one? I can count the times on one hand. Foote not only defends well, but he is able to take the puck away, control it and move it proficiently up to an awaiting forward. Cal can pound the puck. Finding shooting lanes, the soft spoken blue liner can locate seams and knows when to snap the puck into the pads of the goalie or when to unload it in an effort to beat the opposition goalie clean. Points in 9 of his last 12, I think it is clear to see that he is the teams best defenceman with his calm and steady play. Reid Gardiner had 1+1=2 and is riding a team high 15 game point streak. With 34 points in 25 games, the 21 year-old has delivered the mail like the organization had hoped when he was acquired in early January. The fear is giving up a quality player or draft pick for a player who under delivers. In only two games this season has Gardiner failed to find the score-sheet. That's what elite offensive players do. While the Rockets were able to beat the Royals twice this week, let's remember they were playing without some significant players. When you don't have Tyler Soy nor Chaz Reddikopp in the line-up, the chances of succeeding are lessened. The Royals are a handful for whoever they face in the opening round. The Rockets remain 2 points back of the Prince George Cougars for first place in the BC Division with three games remaining. It sets up for a massive game Wednesday night at Prospera Place when the Everett Silvertips come to town. A win will move the Rockets into a two way tie with the idle Cougars, but the Rockets will be in first place for the first time this season. Yes, you are reading it correctly....the FIRST TIME. Is it the biggest game of the season? Without a shadow of a doubt, it really is. Tonight’s Preview: Welcome to the second last weekend of the regular season. Tonight the Kelowna Rockets play game three of a six game home stand against the visiting Vancouver Giants. This is the 6th of 8 meetings between these two teams. These two teams close out the season with a home and home series next weekend. The Rockets are 4-1-0-0, having beaten the G-Men in back-to-back games in February by scores of 6-0 and 5-0. Overall, the Rockets have won 22 straight home games against them. The Rockets are coming off a 4-3 win over the visiting Victoria Royals Tuesday night. Nolan Foote, Leif Mattson, Calvin Thurkauf and Carsen Twarynski scored in the teams’ 41st win of the season. The team has 14 wins in the last 17 games (14-2-1-0) while earning a point in 12 of their last 13 games (11-1-1-0). Following tonight’s game, the Rockets host Victoria tomorrow night. Overall, the Rockets have won 5 straight and have scored 61 goals in their last 13 games. The Matchup: Kole Lind and Calvin Thurkauf each have 3+4=7 against the Giants this season. Cal Foote and Nick Merkley each have 2+4=6 in five games. Nolan Foote has a hat trick against the G-Men. Brodan Salmond has started in 4 of the 5 games, posting a record of 3-1-0-0 with a goals against average of 2.01 with back-to-back shutouts. In the last 29 meetings, the Rockets are 25-4-0-0. Milestones: Reid Gardiner played in his 285th career game Tuesday night…Devante Stephens plays in his 200th game tomorrow night…Gordie Ballhorn plays in his 100th game tomorrow night…Lucas Johansen is three games shy of 200 for his career. Johansen also has 95 career points, 5 shy of 100. Streak’n: Reid Gardiner enters tonight’s game riding a 13 game point streak. Gardiner has 8+11=19 over that stretch. The 21 year-old also has goals in 5 of his last 7 games. Rodney Southam has points in 7 of his last 10 games with 6+7=13 over that stretch. Dillon Dube has points in 8 of his last 9 games (7+10=17). Dube also has goals in 6 of his last 8 games. That’s a fact Jack: The Rockets have not allowed a power play goal against in 10 of their last 13 games and have successfully killed off 42 of their last 50 penalties….The Rockets have scored 258 goals this season, 18 more than at the same time a year ago….The Rockets have allowed 196 goals against, 4 fewer than at the same time last year….Michael Herringer was named the WHL Goalie of the Week March 6th by posting a record of 3-0-0-0 with a goals against average of 1.10….Lucas Johansen signed an entry level deal with the Washington Capitals last Thursday. Johansen was a 1st round pick of the Caps this summer…The Rockets have 87 points this season, with 10 available points over the final 5 regular season games. The most points the team can earn this season is 97, which puts them three shy of the 100 point barrier the team has reached in each of the last four seasons…The Rockets have played 35 road games this season, with one more stop in Vancouver…The Rockets have now won 20 or more road games in five consecutive seasons. The last time they failed to hit 20 wins was in 2011-2012 when they won 15 games away from Prospera Place…The Rockets have lost their last 4 overtime games …The 56 shots the Rockets put up against the Vancouver Giants February 10th were a season high….The 15 shots the team surrendered February 22nd against the Edmonton Oil Kings was a season low…The Rockets have generated 30 or more shots in 25 of their last 28 games…The Rockets have surrendered 5 or more goals 13 times this season. The teams’ record, not surprisingly, is 1-11-2-0. Broadcasters Bits: The Rockets were 15 points out of first place in the BC Division at one point. Now they are just two points off the pace with a game in hand on Prince George…Four of the Rockets final 5 games are against teams in the BC Division….The Rockets are 60-1-4-0 when leading after 40 minutes in the last two seasons….The Kelowna Rockets lost 10 of their first 21 regular season games. Since then, the team has 11 losses in the last 46 games… In the Rockets last 12 losses (regulation or overtime loss) the opposition has opened the scoring…The Rockets are 16-6-2-0 since the trade deadline The Rockets compiled a record of 10-2-1-0 in 13 games in 26 days in February…The Rockets were 8-3-2-0 in December...The Rockets were 6-4-0-0 in 10 games in November after going 8-4-0-0 in 12 games in October…The Rockets are the only team in the WHL that has failed to surrender a shorthanded goal against this season…The Rockets are 17-12-0-0 against BC based teams this season …The Rockets are 11-3-3-0 against U.S Division teams this season….The Rockets have allowed fewer shots on goal than at the same time last year. The team has surrendered 222 fewer after 67 regular season games. A few nervous moments for the Kelowna Rockets in last night's 4-3 win over the visiting Victoria Royals. Controlling the game for the opening two periods and eventually building up a 4-0 lead, the Royals struck for three, quick, third period goals in an effort to dash the Rockets hopes of finishing first in the BC Division. Instead, the home team earned their 41st win of the season and moved within two points of the Prince George Cougars with 5 games left in the regular season. To think, the Rockets were already two points off the pace after an opening night loss in Kamloops. That deficit widened and widened and widened further as the Rockets lost 10 of their first 21 games while the Cougars started the season 8-0-0-0. I guess it is true. It's not how you start, but how you finish. Nolan Foote opened the scoring with his 17th goal of the season. I've been asked what the Rockets franchise record is for goals by a 16 year-old forward. The answer is 25. Both Nick Merkley and Shane McColgan accomplished the feat in their first seasons in the WHL. Colour Analyst Kent Simpson got it right on our AM 1150 broadcast when evaluating why Royals head coach Dave Lowry elected to yank starting goaltender Griffen Outhouse after surrendering Calvin Thurkauf's goal to make the score 3-0. Lowry made the change, not to show his disapproval of Outhouse's play, but that of the team in front of him. The goaltending change seemed to spark the Royals, who had little in the way of anything going on, specifically in the first period when they were out-shot 18-8. To that point, Royals forwards Matthew Phillips, Jack Walker and Dante Hannoun had created little in the way of scoring chances. You have to hand it to both Rodney Southam and Carter Folk for a spirited fight early in the second period. It was a solid slugfest as the two swung wildly in as good a middle weight tilt as we've seen at Prospera Place this season. It was Southam's 11th fighting major of the season, which matches his total from 2014-2015, Is Southam not the teams 'Unsung Hero'? Having a career year offensively, Southam stands up for his teammates and would have played in every game this season if not for a family matter. Southam is very durable and his shot blocking is an inspiration to his teammates. I really liked the fourth line. Comprised of Leif Mattson, Eric Gardiner and rookie Jack Cowell, those three had significant zone time and had an absolutely excellent shift in the second period when they were buzzing and hemming the Royals in their own end. It would be Leif Mattson's third period goal which stood up as the game winner. For my money, Mattson should be a permanent fixture of that fourth line...unless I am missing something about his play that makes him a liability? I just notice him making a positive contribution when he is out there. I can take a mistake if I see effort...and I see effort. The dude has 4 goals in his last 7 games. The Rockets penalty killing unit came up large - again! Shutting out the Royals on 4 chances is impressive considering the visitors had scored a whopping 12 goals in their last 23 chances with the extra man. As always, a good conversation with Dave Lowry before the game. I enjoy my chats with him. It would be nice to sit down with him sometime over an adult beverage, but something tells me he isn't into that. The Rockets continue a 6 game home stand Friday night hosting the Vancouver Giants before hosting the Royals, again, on Saturday night. Let the scoreboard watching continue tonight as the Cougars visit the Winterhawks while the Blazers host the Royals.